Some lancianews-readers will recall an article on a Lancia body design by eminent 20th century architect Adolf Loos. 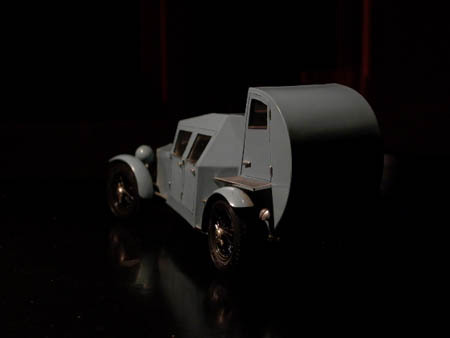 The design (1923) was probably done by Loos having a Lambda chassis in mind. 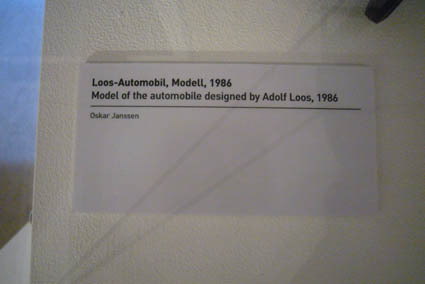 Since the design remained unrealised Dutch architect Oskar Janssen made a model of this body, the Loosia, decades later. 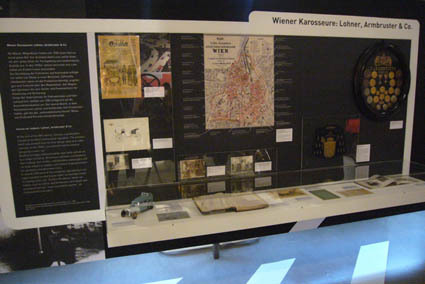 Fortunately, there is now the opportunity to see the Loosia as part of the exhibition „Spurwechsel“ which takes place at the Technisches Museum Wien (TMW) currently. 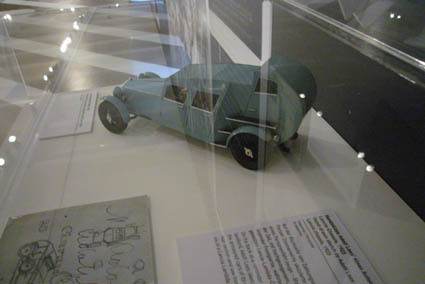 This current exhibition at the TMW shows the development of the automobile during the course of the 20th century, its influence on society and implications for urbanism especially. It is a complex theme and covers a huge range of developments: From the beginnings of motoring, the automobile’s introduction into urban space as well as into society. Starting as an elitist way of transport (a kind of entertainment, either a means for countryside excursions or racing/sports) and its transformation as a means of mass transport (again starting selectively from holiday travelling and changing to daily transport). 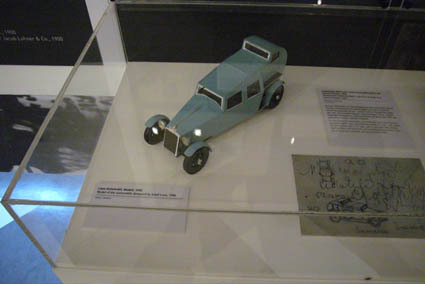 The exhibition also shows modernist expectations linked to the automobile and the frustrations which led to protests by „the green movements“. Also part of the exhibition I enjoyed proposals by artists and socialogists to regain the huge urban space which is now more or less exclusively used by cars: streets, parking spaces, garage etc. A group of young architects asked people in the streets what they could imagine to do in public parking space lots; like B&Qing, sunbathing, placing a dinner table there and enjoying lunch for two, doing some work-out etc. The film showing these ideas come true and the reactions by onlookers…. I also like the way the exhibtion opens emotional space to regain our experience of growing up in the world of the automobile. The „traditional“ museum selections shows a Lohner-Porsche (electric car), one of the first automobiles (the Marcus-car), a nice ’30s Austro Daimler ADR6 (a specimen of elitist travelling), a Puch 500 (a derivative of the Fiat 500 showcasing mass transport) and more modern developments. Attached find photos of the Loosia in the exhibition which I can highly recommend.